As the obesity epidemic becomes more visible in the public consciousness, more and more people are examining their meals - even fast food items - for their dietary value, and curly fries calories are some of the biggest surprise offenders in the industry. Many consumers assume that because curly fries are in fact a vegetable product (potatoes) rather than a sugary dessert or other traditionally unhealthy dish, they must have fewer calories. How the fries are prepared and the portion sizes presented, however, create some of the most calorie-laden side dishes imaginable. Small Serving (105 grams): 340 calories. Medium Serving (130 grams): 410 calories. Large Serving (200 grams): 630 calories. To break those numbers down into better figures, consider that the 340 calories from a small serving contains 160 calories purely from fat, which is 28 percent of the Food and Drug Administration's (FDA) recommended daily fat intake for a 2,000 calorie diet. Of that, the serving also provides 1025 percent of the recommended daily intake of saturated fat, or more than 10 times the daily recommended amount. Furthermore, curly fries also supply one-third of the recommended sodium intake for an average adult before extra salt is added by the consumer. Additional toppings add even more calories to the snack. Adding melted cheddar cheese, for example, adds another 100 calories for a regular sized order, and other toppings such as chili, sour cream, or salsa make the fries even less healthy. Many consumers are shocked to learn just how many curly fries calories there are, but when one considers how the potatoes are shaped and cooked, the reasoning is obvious. Because curly fries are cut with a special spiral slicer to create their distinctive curls, there is greater surface area on each fry than on standard straight-cut fries. Every surface of the fry is then cooked in oil (fast food restaurants frequently use partially hydrogenated corn oil, one of the major sources of trans fats in consumers' diets), which clings to it and adds to the calorie total. Seasonings add only a few negligible calories when compared to the overall total, but they are responsible for the unhealthily high salt content of the snack. 17 cucumbers is equal to one medium serving of curly fries. Knowing what curly fries calories are equivalent to puts the health detriments of the starchy side dish into proper perspective. Despite the fact that they are calorie-laden and provide only minimal nutritional value (curly fries contain minor amounts of calcium, iron, and vitamin C), curly fry lovers do not need to give up their favorite fries in order to eat a healthy diet. 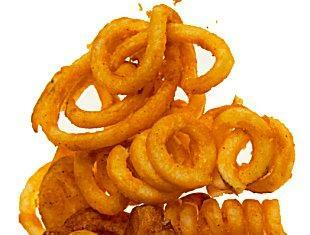 The key to enjoying curly fries without regretting the intake of calories is moderation. Instead of choosing the largest serving as part of a meal, eat a healthier meal and opt for a small portion, or plan on adding curly fries to your diet several days in advance and make other adjustments accordingly (skipping dessert, choosing healthier dishes, etc.). Avoid adding additional toppings or ask for them on the side to control their portions more carefully, and consider splitting the serving with another curly fry fanatic to cut calories without abandoning the fries altogether. If making the fries at home, consider using healthier oils such as canola oil or baking the fries to lower their calorie content. Curly fries may be an extremely unhealthy food item, whether they're purchased at a fast food restaurant, carnival, or made at home, but knowing precisely what they do and do not add to a diet can help consumers make knowledgeable choices about their meals. Any treat can be enjoyed in moderation, and a snack is more enjoyable when you are aware of the health consequences and can keep control of your diet despite the occasional splurge on twisty, spirally treats.